We didn’t intend for screen free living to become so intentional, but our oldest is a tween now and we’ve only been more grateful to avoid the individual screen trend right from the start. Of course our kids occasionally do school work on the computer, family movie or mario cart nights are often a favorite. We aren’t martyrs to giving our kids an unplugged childhood, but we have seen a lot of benefits to keeping individual screen time out of our family time. Avoiding the personal tablet & smartphone trend with our kids has produced results so positive that we plan to keep it that way. Our kids are enjoying their childhood so much, we didn’t want to see it stop. We weren’t trying to ruin their fun, it was an intentional goal to add something we realized was even better. Now that our older kids have hit the tween years we are beginning to get questions on occasion, “can I have an Ipad for my birthday?” As parents we shake our heads & come up with some other options. Instead of a smartphone we will think of ideas like a MP3 player, a stack of CD’s for their little boombox or an actual camera. notice they don’t have screens. However they have also enjoyed what we have given them in exchange, which is getting a more connected childhood, so they don’t complain. It’s easy to think that saying no to something like screens is nothing but negative, when in fact saying no to screens is saying yes to a more fun & connected childhood with a far more positive impact. An imaginative childhood for our young children is now something parents have to strive for, it won’t come naturally & this is especially true as kids get older. There are only so many hours in our children’s day, as parents it up to us to help our kids to manage their time wisely. Eventually we realized we were having so much fun doing things as a family unplugged, it was difficult to even make time for individual screen activities. To us the choice eventually became more intentional, yes to more family fun and no to individual screen time. As a result our kids typically(not always of course!) have positive attitudes, strong sibling relationships, engaging friendships, opportunities to explore the outdoors & large stacks of books they are eager to read. 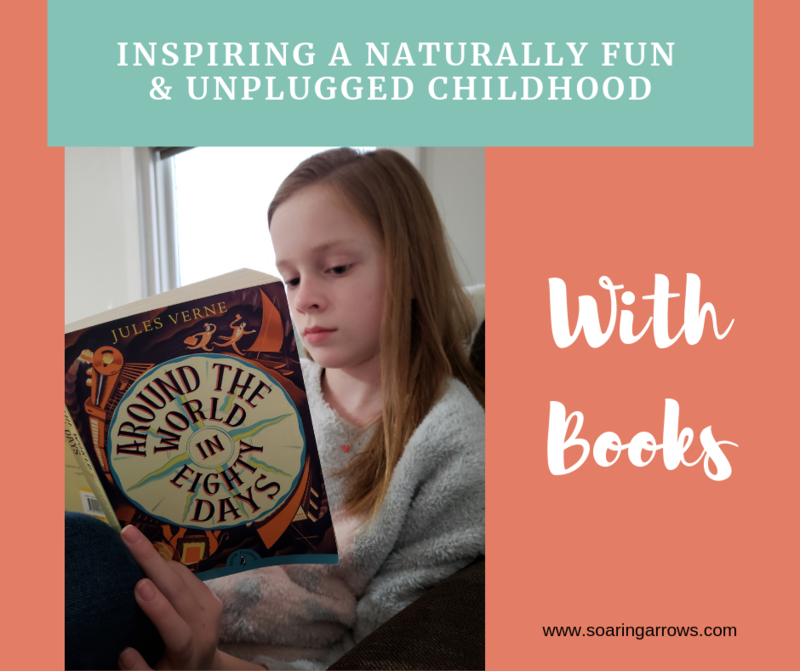 Many parents desire for their kids to have a childhood filled with imaginative fun, I have found the best way to find it can often be in the pages of a book. One of the reasons our family doesn’t miss screens is because we have filled their minds & hearts with compelling stories. We use Sonlight Curriculum in our homeschool which has given us the tools & resources to help our kids come up with their own creative play. My kids aren’t looking to me for entertainment & if they are, it’s usually for a book recommendation. As a result, they are inspired by these stories to come up with their own creative play! Each afternoon I simply read aloud and they are set for hours of imaginative play. Sometimes they play that their stuffed animals live in Rome and plan out a mystery to solve after listening to Detectives in Togas. They built animal nests for stuffed animals in our backyard with dried up grass after listening to Owls in the Family. Countless hours are spent drawing pictures inspired by the many stories we have read from around the world. Last Summer my kids even tied jump ropes and strung them from our deck to the swingset, hung a basket on it and gave their stuffed animals rides for half the summer. I don’t know if a book inspired that but it was pretty cool! Books have wired them to come up with amazing ideas & adventures completely on their own. Books like Henry Huggins give them a glance into some mischief they could find themselves in with neighborhood friends. Caddie Woodlawn gave us the reminder that a wild childhood spent in woods is a pleasant one. Ginger Pye opened our hearts to the fact that adding a pet to our family was one of the best things we have ever done! For children and grown ups alike, stories are the insight into the fun we can have in the real world. Sonlight curriculum & the resources it provides, has blessed our kids with the opportunity to have a childhood unhindered by a strong desire for devices. Part of that has been our choice, but it has been far easier to have resources to inspire so much creative play & curiosity for the world. I’d rather see my kids hearts longing for books than craving the addiction of a screen. Most parents of today remember what it’s like to have an unplugged childhood. One spent connected in relationships with others who were often right in the room or just past the backyard. A childhood filled with wonder over the call of a bird, a simple afternoon at the beach, time spent reading, baking cookies in the kitchen with mom or dad, or a late night catching fireflies with friends. The ability to relax, laugh and play together unhindered by the distractions of electronics. If your goal is to raise unplugged kids, I encourage you to find something beautiful and fun to replace the tablets with. Parents, you’d be surprised how much your kids just want you, plugging into them. Being there to hear their silly stories, playing games, sharing our favorite music with them, heading outside to play or sitting down for an amazing story. They are craving you more than they are craving that device. Be encouraged that living unplugged doesn’t have to be something we do out of fear or regret, but something we choose on purpose because we just know deep down there is something better we can choose for our kids. If you don’t know where to start, I’d suggest starting with a quality book to sit down and share as a family. Sonlight Curriculum has a fantastic list of read aloud books to get you started which is one of the reasons we love Sonlight curriculum so dearly. 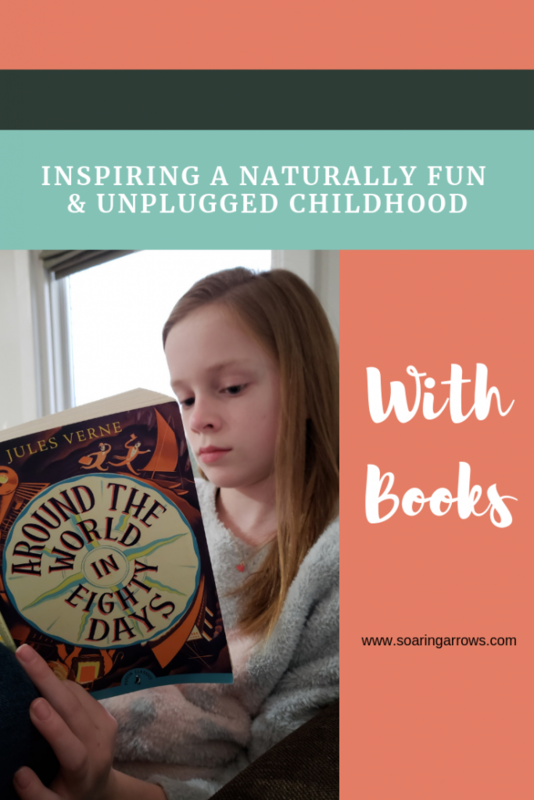 You don’t have to be a homeschool family to be purposeful about sharing amazing literature with your kids! Grab your favorite childhood book, find some new ones & let it capture that connected feeling we are all striving for in our families! I so appreciate the balance I read in your post. Blessings to your family. Join Soaring Arrows On Facebook!